If you are reading this you either have a pet, horse, or work in this great industry. I love it when companies incorporate pets on their Facebook, Twitter, and website. They humanize it when they add pictures of their dog, cats, etc in their website. 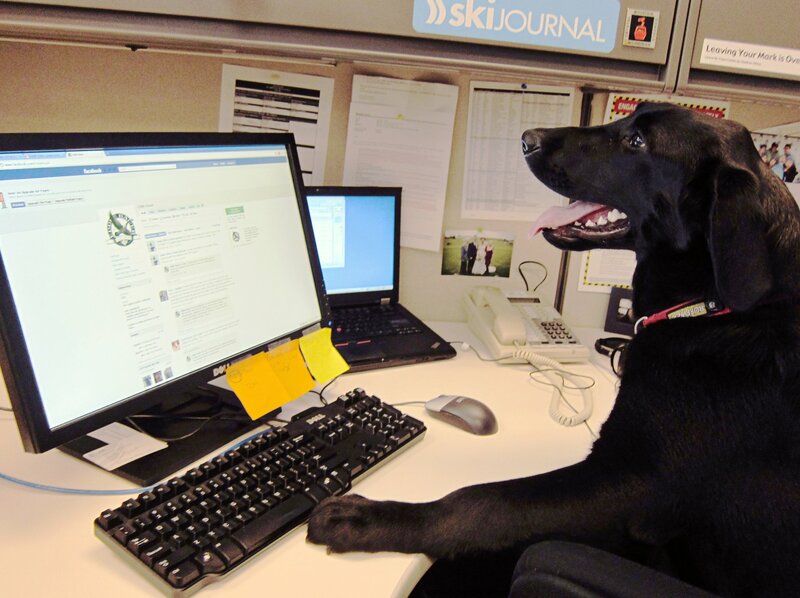 As a mother of a chocolate lab, I always get a kick out of pictures of other dogs whether they take them to work or make them pose at their desk doing something silly. It makes me want to spend $$$ at their store, since we have this bond in common. 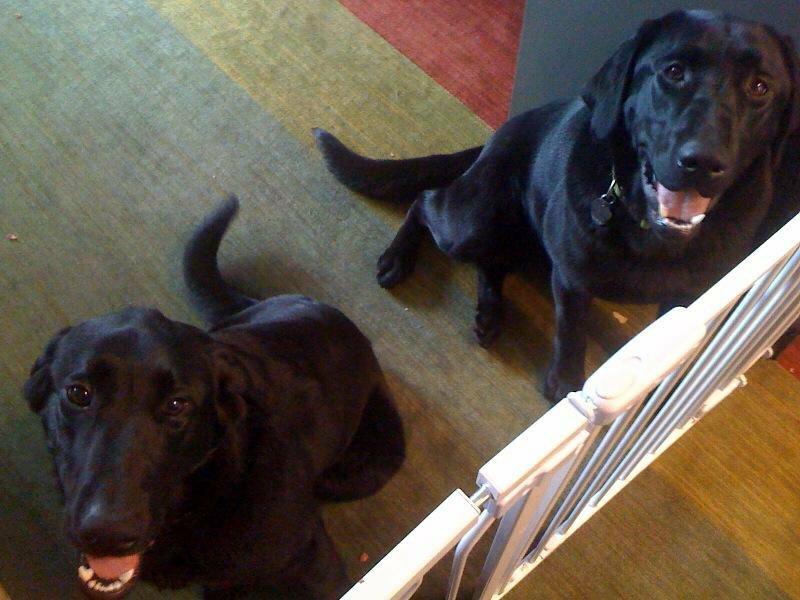 One of my favorite stores to shop, Eddie Bauer, uses a mascot, their black lab, named Eddie, shown here with his half-brother, Bass (chocolate lab) by sending Facebook updates and Tweets of his puppy pictures, camping, and birthday. Good way to stay on the mind of their customers in a non-harassing way! Bravo!!! Eddie (Bauer) and BassEddie on Facebook! I’m searching for the perfect internship in marketing. 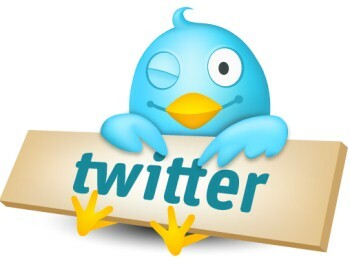 I decided it is not enough that I’m graduating with a Masters of Business Administration degree in October and that I have a huge following in Twitter, Facebook, and on Youtube as a blogger. To keep myself competitive I have decided to start an aggressive training for an (“Inbound Marketing”) online certification from HubSpot (Cambridge, MA) a software company that helps increase visitors, convert those visitors into leads, close the leads easily, and has useful tools for analytics. This course includes 16-(one)hr online classes from experts in the industry, 10 reading assignments (including case studies), and topics include: Advanced SEO Tactics, Keywords, Blogging, Social Media, Marketing Analytics, Lead Nurturing, and Email Marketing to name a few! To my fans, I will be a little bit quiet in the next week or so as I try to finish this challenging and exciting course in the next week. All I can say is that I am not the same person I was a few days ago, I am learning so much information, as of right now, I am half way done and I have this sudden and high confidence in myself that I can make a difference to the company that chooses me as an intern because of the knowledge I’m obtaining from HubSpot! If I didn’t use Twitter, I wouldn’t have met the most amazing/influential/successful people in the industry, been the first person to tell my social circle about breaking news (like this), and had a form to express my thoughts creatively to my followers.